As can be seen, iodine and xenon concentrations significantly differ with certain neutron flux level. 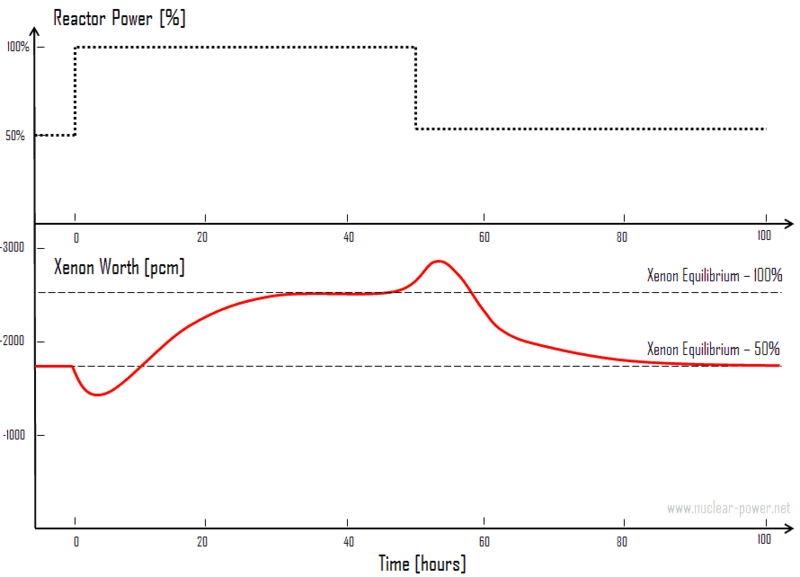 Here, we will illustrate a typical xenon transient between different power levels. Recall, the proportion of 135I (6.6h) and 135Xe (9.2) half-lives is very important and determines these transients, especially those with power reduction, where the xenon buildup rate is higher than xenon decay. Consider the power increase from 50% to 100% of rated power. Consider a reactor that is operated at 50% for a long time (i.e. iodine and xenon equilibria are established). At time t0, reactor power is raised from 50% to 100% of rated power. When the reactor power is increased, xenon concentration initially decreases because the burnup is increased due to higher reaction rate. Because 95% of the xenon production is from iodine 135 decay, which has a 6.6 hours half-life, the production of xenon remains constant for several hours. After a few hours (roughly 4 to 6 hours depending on power levels) the rate of production of xenon from iodine and fission equals the rate of removal of xenon by burnup and decay. At this point, the xenon concentration reaches a minimum. The xenon concentration then increases to the new equilibrium level for the new power level in roughly 40 to 50 hours. It should be noted that the magnitude and the rate of change of xenon concentration during the initial 4 to 6 hours following the power change is dependent upon the initial power level and on the amount of change in power level. The xenon concentration change is greater for a larger change in power level. For a power decrease the behaviour is reversed.